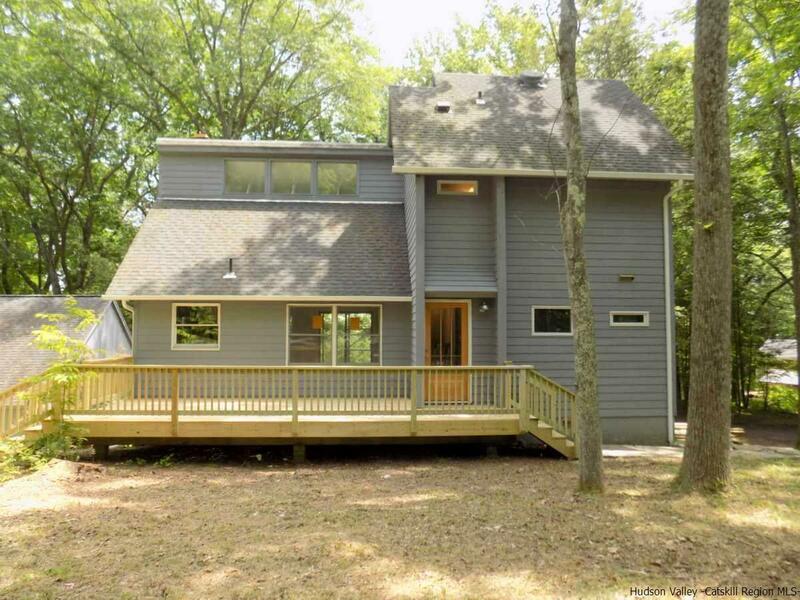 This Gardiner 3 bedroom, 3 bath contemporary home is nicely sited amongst the trees below the Shawangunk cliffs on a dead end road with underground utilities and only a 10 minute bike ride from Minnewaska and Mohonk access. The modernist home features a fab kitchen with dark stainless appliances, sleek cabinetry and quartz countertop, a main level master suite with new bath, a great room with soaring vaulted ceilings, a Japanese style meditation room on the second floor and finished space on the lower level. There are new decks on both the front and rear of the house to take in the beautiful surroundings. And don't forget the wonderful 36' x 23' studio building with polished concrete floors, radiant heating, high ceilings, full bath and double sliders to a private deck. So much value here for the price and very easy to show.